What’s local in our mixed up, globalised world? I belong to what’s arguably the biggest club in the world, whose members number not in millions but billions. Everywhere I go, I meet fellow members and, sooner or later, conversation drifts to our shared membership in – parenthood. Last weekend, I was absorbing the sights, sounds and smells of the Laguna province in the Philippines in the exalted company of academic colleagues from the College of Development Communications, University of Philippines Los Banos. At one point, we walked past some old houses designed in Spanish style – a reminder of the country’s strong Spanish legacy. I heard how the Filipino language has absorbed or adapted hundreds of Spanish words, so much so that the younger generations don’t realise the Spanish origins of many words they use everyday. One colleague related a story. 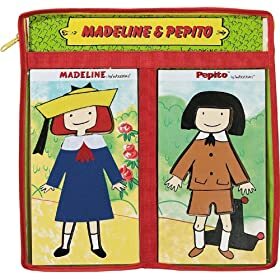 Her daughter (now 16) had been a fan of ‘Madeline‘ – an animated series based on the popular children’s books by Ludwig Bemelmans, an American author of Austrian and German origins. Read more about Madeline animated TV series. Happy coincidence: my daughter Dhara (still 11) and I are fans too of the smart and adventurous little French girl who lives with 11 other kids Miss Clavelle’s boarding school in Paris. Although the smallest girl, Madeline nevertheless manages to get herself into one predicament after another, giving her friends and teachers much to worry about. In the end, though, she always comes out all right. Madeline is a good friend of the Spanish Ambassador’s son, Pepito. The young boy occasionally slips in a few Spanish words or phrases. This happened in one episode when Pepito was talking about sombreros. It’s a small reminder of how delightfully mixed up our cultures are – and not just in language. Many of our metaphors, references and other expressions have been borrowed and adapted from other cultures and traditions in far corners of the planet. After a generation or two, few remember the origins. It’s becoming impossible to discern or define what is ‘local’ anymore in this rapidly globalising and integrating world. Sociologists and communication researchers who split hairs about preserving ‘local content’ have a romanticised notion that is hard to find in the real world. ‘Content creation’ describes something that we journalists, as well as film-makers, writers and creative artistes have been doing for centuries. For much of that period, content was entirely local. It was only in recent decades that information and communications technologies (ICTs) enabled content to be swapped around the world at the speed of light. And some ICT activists feel the need to make content more local again. No doubt an ideal. But I keep asking them: just what is local anymore in our rapidly integrating and hopelessly mixed up world? Does it really matter anyway, except to the cultural purists who live in ivory towers? Dewitt Wallace, the American founder of the Reader’s Digest magazine, was fond of pointing out how much his publication had become a part of the everyday lives of millions of people worldwide. One of his favourite anecdotes was about two children born and raised on a Caribbean island. On their first visit to the United States, the kids were walking on the streets of New York, in the magazine’s home state of New York (Reader’s Digest is owned and published by The Reader’s Digest Association, a privately held company based in Chappaqua, New York, but the mailing address is actually Pleasantville, New York). On seeing the magazine on sale at newsstands, one of them exclaimed: “Look dad, they have the Reader’s Digest here too!”. I personally think we should focus more on content that is locally relevant and locally useful. If it is also locally generated, that’s well and good — but does the point of origin matter too much in this knowledge society, when we are swapping electrons and ideas across political boundaries?